Thank you for your support during this difficult time. Please enhance this tribute to Virona by adding your memories and photos. Virona Gertrude Palmer, age 88, of Rising Sun, MD passed away peacefully on Sunday, July 22, 2018. Born November 19, 1929 in Red Star, WV, Virona was the daughter of the late Dennis and Rose (Craft) Callahan. 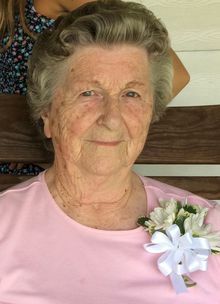 Virona was a lifelong member of Conowingo Baptist Church. Family and faith were what she held most near and dear to her heart. She was a devoted wife, mother and grandmother. Her family and close friends often joked that she was better than June Cleaver. Virona is survived by her loving husband, Robert Doil Palmer, Sr.; five children: Robert Doil Palmer, Jr. and his companion, Lisa Mudrock, Rose Taylor and her husband, Mike, Brenda Graybeal and her husband, Bob, Robyn Devonshire and her husband, Terry and Melissa Ward and her husband, Tom. She is also survived by ten grandchildren and fourteen great grandchildren. Including her parents, she was also preceded in death by her son, Roger Palmer. A celebration of Virona's life will be held at 11:30am on Wednesday, August 1, 2018 at Conowingo Baptist Church, 151 Rock Springs Rd, Conowingo, MD 21918, where family and friends may visit beginning at 10:00am. Burial will follow in Conowingo Baptist Cemetery. In lieu of flowers, memorial contributions may be made payable to "Conowingo Baptist Church" and send in care of R.T. Foard Funeral Home, PO Box 248, Rising Sun, MD 21911. Sorry to hear of your loss. Yu are in my prayers. To all the family of Mrs. Palmer, I am so sorry for your loss. She and Mr. Palmer were such wonderful people and treated everyone like they were part of the family. She was truly a gem and an example of what lady should be. May God's peace be with you all. We are so sorry to here of Mrs Palmers passing. The Palmers were the first neighbors we met after moving to the Rising Sun area. Our condolences to the family. Aunt Virona I am going to miss you terribly but I know you are so happy in your eternal home with your Lord. My heart goes out to all her loved ones and pray that you find peace in your hearts knowing she is where she wanted to be. I already miss my Aunt Virona. Sweet, lovely lady. What a wonderful picture you chose.